Holdfast: Nations At War | Post launch update. Thank you! Between hitting the front of Twitch, flooding our servers over capacity, reaching the top sellers on Steam and the discovery of latency issues, our release and following fortnight was interesting, to say the least! The team in Malta elected unanimously to forego the optional activity of sleep to address some of your immediate concerns and start introducing new content into the game. We would now like to take the time to update you on what we have been working on since launch. You can find all the changelogs down below. Holdfast: Nations At War has been updated! Within this update, you’ll be seeing all the improvements and content from the previous Beta changelogs. A new map, additional tunes for the violinist, fifer and drummer, server-side optimisations to improve stability, gameplay balancing, bug fixes and more! Be sure to keep an eye out for one of our blog posts next week! You will be able to vote for the next faction that is introduced into the game. 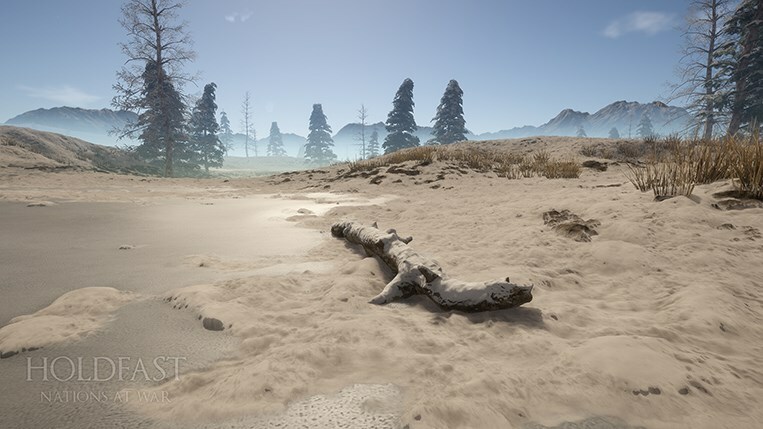 - A new map has been included into the game! Fort Christina. It is playable on the Army Battlefield, Assault, Siege & Deathmatch game modes. - Added two new Fife and Drum tunes, one for the British and one for the French. Go play to your heart's content! - Added three new tunes for the Violinist. - Improved the performance and clarity of sound of the VOIP system on the client and server. This is a part of our ongoing efforts to improve stability on servers and better melee combat. - New particle effects for the smoke that goes out of the pan when firing a musket have been included. - Added a different VOIP over-head icon for Officers and Naval Captains. They are now more distinguishable on the battlefield. - Fixed a bug with the Naval Battlefield game mode where the server was incorrectly determining the winner of the round. - The Server Browser now sorts by player count automatically the first time it is displayed. - Added new Server Browser filter options to toggle full and empty servers. - Added a new Search input for the Server Browser to make finding specific servers easier. - Reverted the default FullScreen (Exclusive) change that was done in the last patch to now use the FullScreen (Borderless) again. This was done because some players reported that their game wasn't able to launch with FullScreen (Exclusive). » Players who wish to make use FullScreen (Exclusive) to benefit from an increase in performance can now do so by following the steps below. Kindly note that your system might not support this feature. If so, kindly remove this launch option. - Decreased the audio volume of other player's warcry noises. - Renamed the 'Toggle Melee Mode' keybind option to 'Toggle Melee/Firearm'. - Increased the height of the Instrument Songs panel to have the songs all fit without a scrollbar. - The VOIP mini icon that is displayed next to your health bar now shows in white instead of green. - Attackers now spawn closer to the defenders in the Coastal Siege game mode. - Fixed an issue with collision on Fort Imperial. - Fixed an exploit on Fort Imperial which allowed you to enter underneath the Fort. - Improved the graphical quality and performance of the Main Menu scene. - You shouldn’t be able to climb up the rocks and jump onto the city walls on Desert Ruins anymore. Instead, the attackers now have a ladder where they can do this from. - Another path near the bridge crossing on Highlands has been included. - Adjusted the Battlefield game mode spawn positions on Desert Ruins. - Added more cover on the Desert Ruins map. - You are now able to continue reloading while climbing one of the ladders on Arendan River. - Performance on all maps has been slightly improved. - Cannons can now rotate more on the South Sea Castle and Martello Tower maps. This is to reduce the blind spots that the defensive positions have. 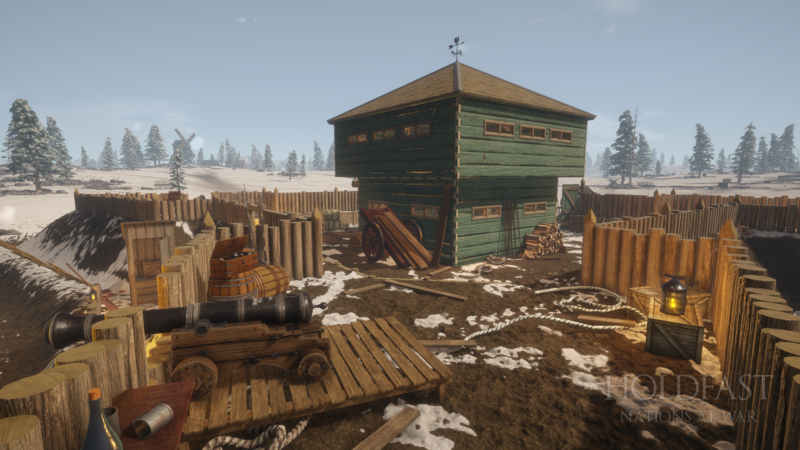 - Another cannon has been included near the Windmill and Barn Spawns on South Sea Castle. - Snow is now less bright during night time. - Included more Cannons on the Martello Tower Map. - There should now be fewer instances where you can accidentally swim underneath the terrain when you try to get on shore. - More cliffs have been included to the front of the Martello Tower making it harder to scale. - Attackers now spawn slightly closer to the defenders on Desert Ruins in the Army Siege game mode. - Fixed an issue where you could spawn mid-air sometimes and fall to your death. 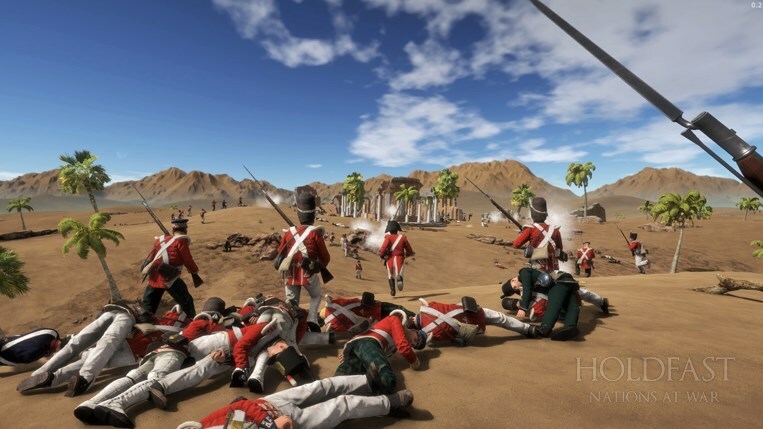 - Holdfast: Nations At War should now launch more quickly. - Ships now spawn slightly closer on the Naval Battlefield open waters map. - Fixed a bunch of client-side errors on South Sea Castle which was causing performance to degrade over time. - Fixed an issue on the server related to melee combat which was causing a memory leak when a new round started. - Fixed the problem with VOIP that occurred in the first build of the beta branch where not everyone could hear each other talk. - Fixed an issue with performance drops on Fort Christina. - The walls on Fort Christina can now take more damage before they're destroyed. - Fixed an issue with being able to fire the swivel guns in rapid succession on Fort Christina. - Reduced the reinforcements for Army Battlefield game mode to 600. - Fort Christina has now been included in the official server rotation. - Reduced the defender’s reinforcements from 300 to 275 in the Army Siege game mode. Another update for Holdfast: Nations At War has been released! This time around, we will be pushing more fixes towards server latency issues as part of our ongoing dedication towards improving melee combat. You will also find new VOIP specific functionality available in this update along with performance optimisations. - Multiple server-side fixes to continue reducing latency on servers. Work on this is still ongoing. - Added a new Round Players window accessed with the ‘P’ key which shows a list of each player in the round with the ability to mute specific individuals. » In the Round Players panel, players speaking nearby using VOIP will be shown in green. » Through this, server administrators can also easily gather the ID of a player used to kick or ban someone from a server. We’ll continue adding functionality to this panel in order to facilitate administration in the future. - Added a new Microphones dropdown in the Audio options to allow for microphone selection. This might help resolve some issues that players were having when not being able to talk with VOIP in-game. - A new VOIP icon is shown on nearby teammates when they are speaking with their microphone. This icon can be toggled on and off through the game options. » Officers and Captains will show a red VOIP icon while other classes will be shown in white. This is so that other players can more easily distinguish the commanding classes. - A new VOIP mini-icon is now displayed next to your health bar when you are using your microphone. - Reduced the overall volume of the in-game voice commands. - Changed the default full screen mode to be FullScreen-Exclusive instead of FullScreen-Window (Borderless). This might help with increasing in-game performance when running the game in FullScreen-Exclusive. - Fixed a bug where the map ambience audio sounds were being cut off when a lot of other sounds are playing at the same time. - South Korean servers now appear as ROK instead of SKR in the server browser. Holdfast: Nations At War has been updated! In this update, you will find a variety of bug fixes, quality of life changes, game balancing along with the implementation of server-side debugging tools to help us narrow down the issues with high latency on servers. Work on the latency issue is constantly ongoing and will continue until the problem is completely solved. We’re aware of the issues with melee combat. As soon as the above is solved, we’ll move forward with more direct improvements towards this mechanic. - Fausberg Forest has now been included in the official Army Battlefield server rotation. 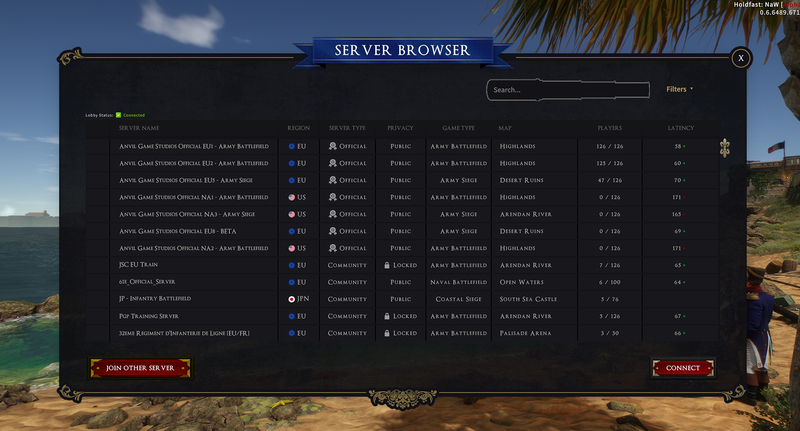 - The Server Browser now correctly reflects the total number of players in a server. 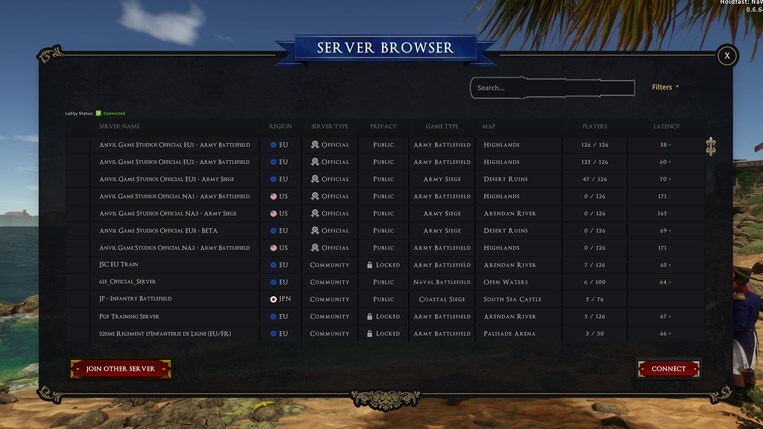 - The name of the server you are currently connected to is displayed at the top-left part of the screen. A new User Interface option has been added to toggle it. - Servers in the Server Browser are now pinged only when they are first shown in the Server Browser instead of pinging all of the servers at the same time. This will result in better performance whilst browsing through servers. - Bots that are spawned on the server are now not included in the Server Browser player count. - Fixed an issue with the friendly_fire parameter for the Server Configuration file. Administrators can now enable or disable friendly fire in a round. - Added 4 new available regions for the servers: China, Japan, Russia and South Korea. Change the server_region parameter in the server configuration file to one of the following: China, Japan, Russia or SouthKorea for the respective flag to become visible in the server browser. - Removed the Crew Reinforcements from ships on the Naval Battlefield game mode. - Fixed a bug where the Scoreboard was only togglable with the Tab key since the key bind from the Options was being ignored. - Fixed a number of exceptions that occurred with the ocean system when a Naval Map level is rotated. - Teams now spawn slightly closer to each other on the Army Battlefield game mode. - Teams now spawn slightly closer to each other on the Army Siege game mode. - Fixed an issue where players could go underneath the bridge on Highlands. - The rowboat now takes a total of 55 seconds to sink instead of 5. This solves the issues were you sometimes get dragged downwards along with the boat and die. - The rowboat now sways more along with the waves. The third update for Holdfast: Nations At War is here! Friendly fire on the official servers has now been disabled. We apologise for the actions of these players. Disabling team killing on official servers is only a temporary measure until mechanics to automatically kick and ban players from servers are implemented. Friendly fire can be toggled on and off by server administrators through the server configuration file. To enable friendly fire back on your server, make use of the 'friendly_fire true' parameter per map rotation. It is important to note that by default, friendly fire is toggled off. The server documentation will be updated shortly. The size of the admin team is also being increased. - Added a Friendly Fire server setting which prevents players from hurting teammates in the game. Server hosters can make use of the 'friendly_fire true' command to enable friendly fire back which is disabled by default. This has to be done per map rotation. - Fixed a bug where the Connect Button in the Server Browser would sometimes take you to a different server. -Added new UI error notification messages that are shown when a player tries to connect to a server which is not updated and also if a player tries to connect to an updated server with an outdated client. - Fixed an issue with the VOIP where other players' voices were being cut out when a lot of other sounds were playing simultaneously. - Changed the default setting for 'Show Voice Phrases In Chat' to false to prevent unnecessary messages showing in chat. If you already own the game, you can disable this through the game options. - The ammo for the firearms has been increased to 60 from 20 because currently there is no ability in the game which replenishes your ammo apart from respawning. - Temporarily increased the Faction Balancing amount to 15 from 3 to mitigate the problem where players were selecting a spawn but are then unable to spawn due to faction balancing discrepancy. This will be permanently fixed in a future update which will allow spawn section spots to be locked once chosen. - Increased the number of supported aspect ratios to include 4:3, 5:4, 16:10 and others. - Greatly optimized the main menu scene. The main menu scene shouldn't lag anymore on low-end computers. - Fixed graphical issues in the main menu that sometimes appeared when launching the game. The second update for Holdfast: Nations At War is here! We are pushing yet another fix towards the high latency issues on servers. Work on this throughout this week will be ongoing until we’re completely sure that this has been solved. We’re also aware of the problems with hitboxes for melee combat. - Melee combat processing optimisations to ease server strain are now present in this patch. This is in an effort to continue solving the high latency issues on game servers. 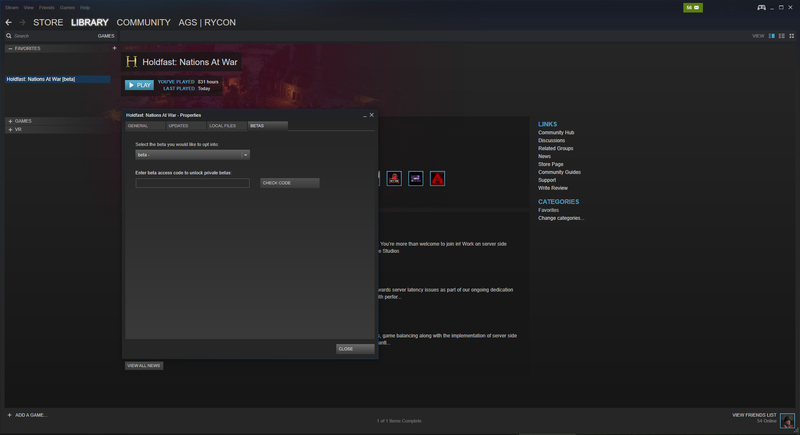 - Players will now receive a notification message in the main menu when they are unable to join a server. You will also receive a notification when trying to join a server that is currently full. - Fixed a number of exceptions that were occurring on the client. This was causing issues with framerate. - A new feature to 'Invert Mouse Y' can now be found in the Game options. - Removed a number of redundant development log entries from the server. This will help continue to improve stability. - An attempted fix towards the issue where ships could sometimes glide through the beach on Fort Imperial. - Players shouldn’t be able to jump on top of the windmills anymore. - Fixed an error that was being outputted when shooting at certain objects. This was causing framerate issues. - Fixed an issue where the Carronade on the Martello Tower didn’t de-spawn when the Martello Tower itself was destroyed. - Fixed an issue where movement speed was significantly reduced when climbing one of the ladders on the Martello Tower. - The 8-Gun Schooner now sails higher above the waterline. - The 8-Gun Schooner now sways more along with the waves. - The 1-Gun Gunboat does not sway as much as before. - Rowboats now fracture instead of sink. - Fixed an issue with the Server Browser changing the current selected row whenever another row is updated (Note: currently there is a known issue where the currently selected row can flicker when another row is updated). We have just released the first update to fix some of the server lag issues that players are experiencing. Until the community servers are updated, we suggest that you join one of the official servers as they already contain the latest fixes. We will continue to work on this throughout development until we’re completely sure that these issues are solved. There will also be the server version displayed in the browser in a future patch. This will allow players to more easily identify servers which are not yet up to date with the latest version. During the previous week, players were given access to the Public Beta branch of Holdfast: Nations At War. This allows us to push constant updates towards the game without having to disrupt game servers. We also want to show our Early Access followers that we’re here and will continue updating the game at a quick pace! 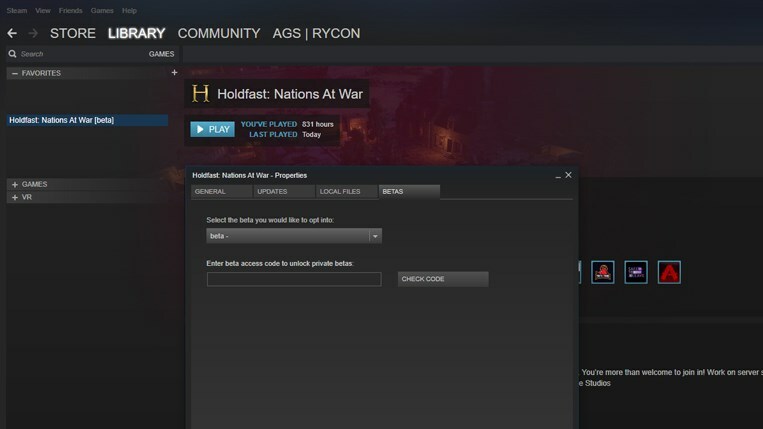 You can access the Public Beta branch yourself through Steam by right clicking on ‘Holdfast: Nations At War’ in your Steam game library, select ‘Properties’ from the drop-down menu, go to the ‘Betas’ tab then select the beta version of the game. After the download is done, you’ll be able to join the ‘Anvil Game Studios Official EU8 - BETA’ server. An official game server hosting the Public Beta branch will be launched as soon as an update is pushed towards that branch. A big thanks go to everyone who previously joined the BETA server to help us with our tests! We have been actively reading and listening to feedback on our forums, Steam boards, Facebook, Twitter and other places where the community gathers. This also includes the game itself! It's a pleasure of ours hopping on game servers from time to time for a good chat. But what’s next on the agenda you might ask? We would like to once again re-affirm our dedication towards continuing to improve upon melee combat. Everything we’ve done thus far on server stability is a requirement before we move forward on direct improvements towards this core mechanic of the game. Work on additional tools to facilitate the administration of events is also ongoing. Server administrators will be able to easily kick, ban, spectate, slay and mute others in the game. All of this can be managed from the same panel that players now use to mute the 3D VOIP of specific individuals. We also hosted a stress test during the previous week which went above the current recommended limit of 126 players per server. The promise we made to work towards further increasing the player count has not been forgotten. You have been amazing so far with all of your feedback, keep it coming! The development roadmap of the game can be seen down below. Keep an eye out for another blog post in the next few days! We will be involving the community in our decision as to which faction is brought next to the game. Be sure to register an account on our forums beforehand. We would like to round this one off with a shout-out to some of our community members who have been out there showcasing the game by recording their own events and public play. This sort of community involvement and showcasing of the game is vital for us and we love watching your content! The game has been featured by Lirik, Admiral Bulldog, Diplex Heated, Malakith, Resonant, Jackie Fish, Criken, Chadtopia, Lord Ironhawk, Lord John, Pixelated Apollo, The Devil Dog Gamer, Lionheart, Eli Thompson, CrReam, PerrysterPlays, TheOne647 and more. Crews and regiments have also played a huge role in the success of the game’s launch. A big thanks go to each and every one of them for their support! We’d love to attend some of your organised events during our short breaks. You’re welcome to send us an invite to them. That is all for today ladies and gentlemen. We’ll be ending our blog post here and continue with development. Once again, thank you. You can join in the discussion for the following blog here and as always, may good health be yours.